How much volume did we harvest from each block, and how does that compare to what the mill cruised it at? How many hours did we spend on each phase of operation in a particular block? Based on those actual hours and the actual volume harvested, how many cubic meters (or tonnes) did we harvest per hour for each phase, and how much did it cost us per cubic meter (or tonne) for each phase? How did our true cycle times compare to the cycle times upon which the mill based our rates? How did our actual piece size compare to the estimated piece size for a given block? How much did we spend in repairs and fuel for the season on each piece of equipment? As critical as it is to have such information at your fingertips, it's a daunting task for the best of record keepers to get data organized in a manner that allows efficient and accurate reporting about the business! That why The Logger's Edge is such a valuable business tool for loggers who care about understanding the economics of their business. 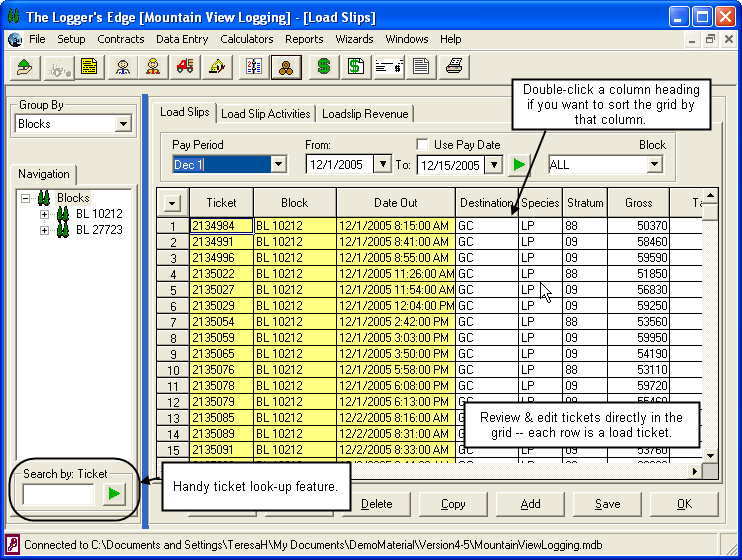 The following pages will take you on a tour of the highlights of the Logger's Edge software. During this self-guided tour, you will see how to enter load tickets, how to set up revenue rates (received from the mill) and pay rates (paid to contractors or employees) associated with those loads, and how to generate pay statements for your contractors and employees. You'll also see some of the rich reporting capabilities that will be at your fingertips by tracking your load tickets through The Logger's Edge. 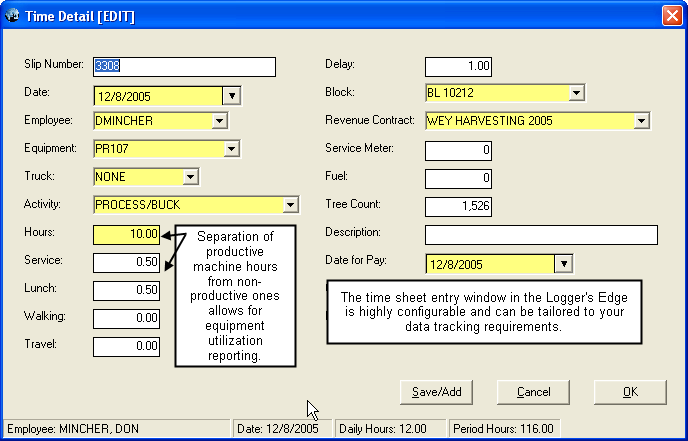 Next, you will see how to enter time slips for your operators/equipment, how to generate pay statements for your hourly workers, and how to run reports showing productive versus non-productive hours spent by block and by equipment unit. 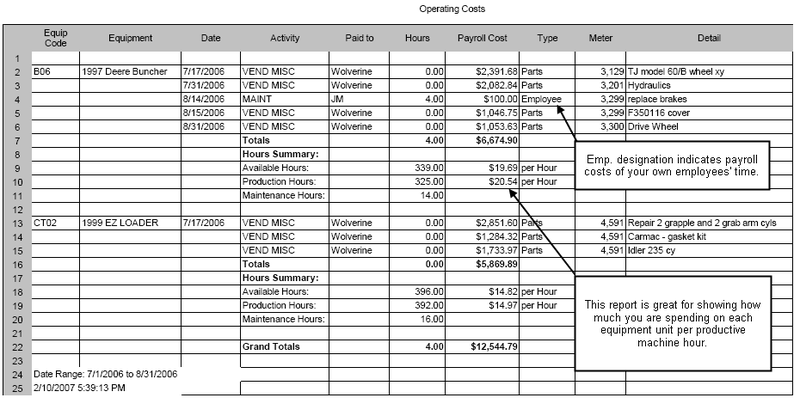 Finally, you'll see how you can track machine costs (e.g., parts, repair, fuel, etc) by machine. 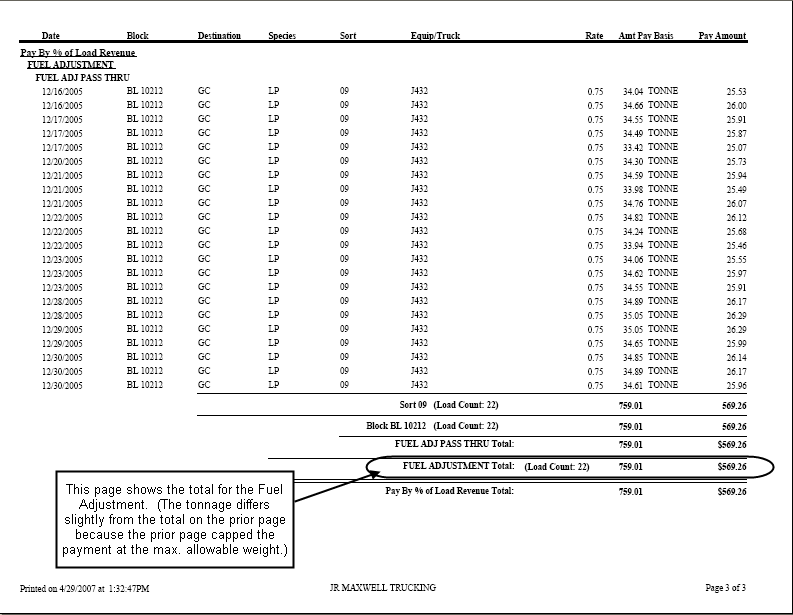 This kind of information is critical in helping you ascertain whether the rates from the mill are adequate relative to your true costs of operating each machine. We hope you find this information informative! If you run into any questions along the way, please call 780-833-9870, and ask for Teresa. The software has much more functionality that what is covered here, so if you don't see what you are looking for, call us and ask! This grid is great for reviewing and editing tickets. If you need to edit multiple tickets for the same mistake (e.g., you need to change the stratum from "88" to "09" on multiple tickets), you can simply copy and paste directly in the grid to make your correction, much like you can in a Microsoft Excel worksheet. When entering tickets, you can use the Save/Add button to speed up ticket entry. This button will clear out the information on the right portion of the load slip (ticket # and weights), but will carry over the block, species, stratum, destination, date, etc. from the prior ticket. This feature really speeds up the data entry process. 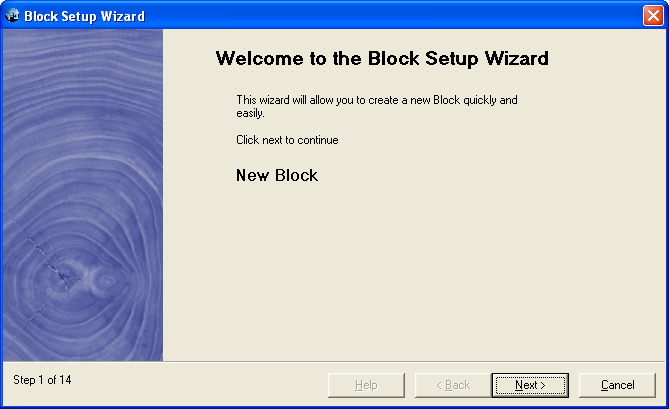 The Logger's Edge uses a wizard window to lead you through the block setup and/or edit process. When you set up a block, you indicate things like the timbermark to which the block belongs, your start date for working on the block, and other basic information. We won't take you through all the steps, but in the screen shots below, we show some of the most important steps within the wizard so that you can see how easy it is to set up your block information. For many loggers, it's an arduous task to keep up with the conversion factors from (weight to volume) for each block. 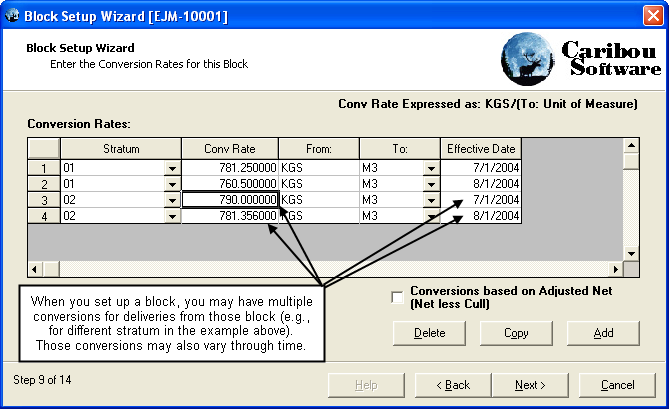 The block setup entry wizard helps you manage the rates easily. If you don't need to convert from weight to cubic meters, you can skip this step. Also, if you don't know your conversion factors, you can come back and enter them later. Many mills provide their contractors with budgeted productivity targets for each block, along with phase-by-phase rates that together sum to the overall logging rate. You can set that information up in the block setup wizard so that you can compare actual performance to your targets. This final window is where you give the block its name and record other pertinent information. The nice thing is that once you have a block set up, you can use the "Copy" feature to create a new block quickly and easily. In general, you will have one or more of these rate sheets for each of your customers. 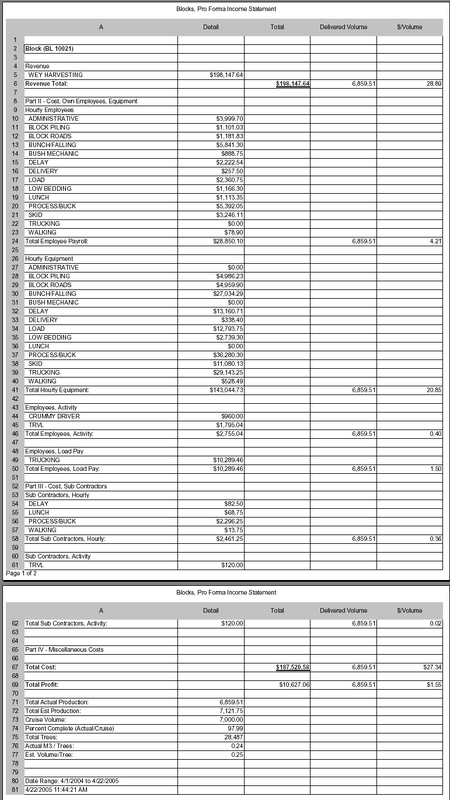 Pay rate sheets look very similar. to the revenue rate sheets. In general, you'll have a pay rate sheet for each contractor (or employee) whom you pay based on the load tickets. Alternatively, if your contractors (or employees) share a similar set of rates, you can use the "wildcarding" features in the system to set up one global rate sheet to cover all of them. These global rate sheets can save you a lot of time if all your contractors share the same set of rates. 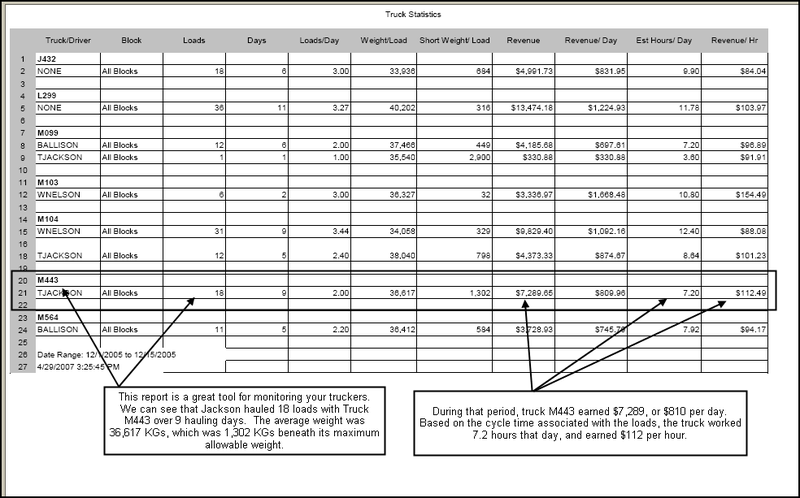 Here is an example of a global rate sheet for trucking contractors. Once you've set up your detailed revenue rates, The Logger's Edge makes it easy to pass on those rates (or a certain percentage of those rates) to your contractors. 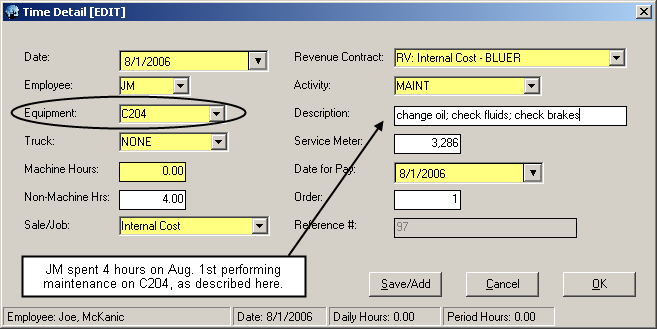 At this point, you have given the software all the information it needs to generate your contractor and employee pay statements, where payment is based on the load ticket. 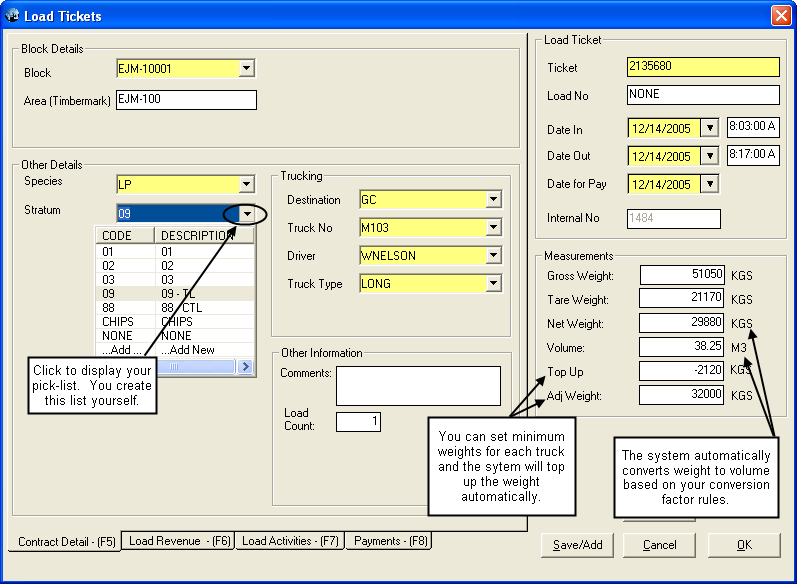 The Logger's Edge has a variety of statement formats, so your trucker statements can be tailored to look differently than your contract processor statements, for example. You can actually control the sorting and subtotaling of data, and you can control the columns that appear in the statement as well. 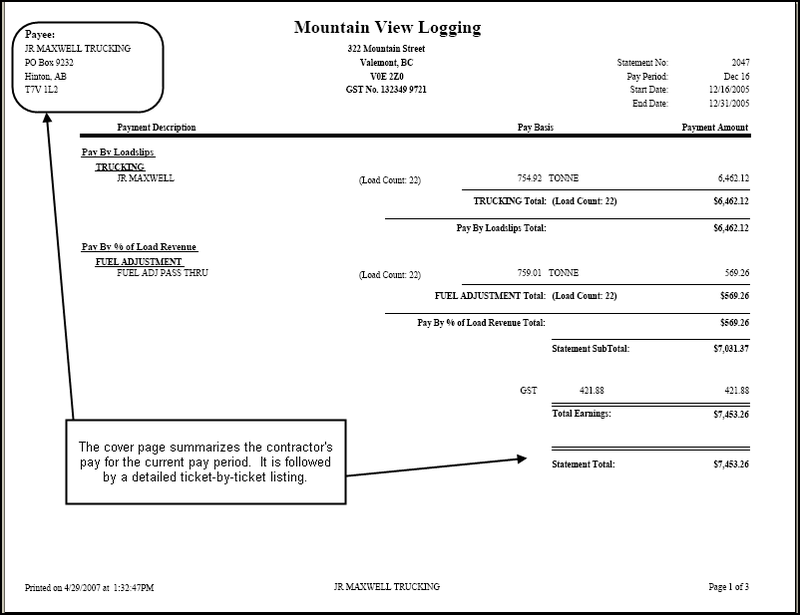 Here is an example of a popular statement format, which has a cover page followed by detailed pages with each ticket itemized. For an extra fee, we can provide you with your own custom statement that has your company logo, and the data organized in a format that you require. 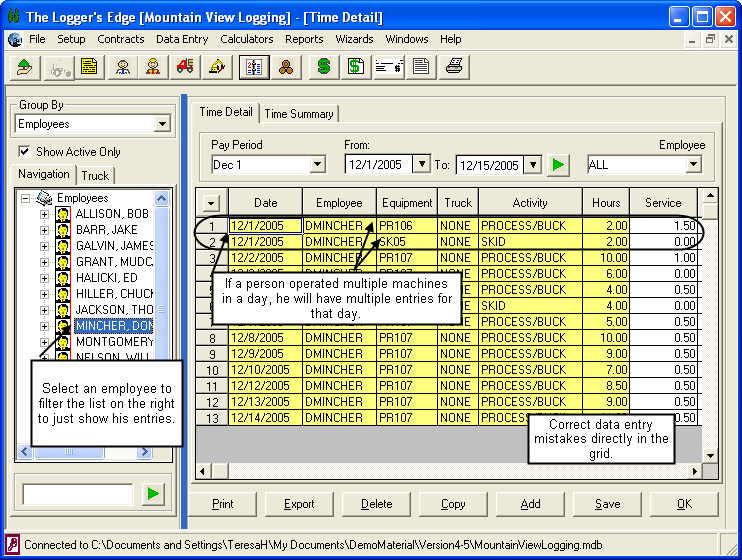 The time slip window is similar to the load entry window in terms of providing a grid review/edit window, and an actual time sheet form for data entry. This screen shot shows the grid listing for time cards for a particular pay period, filtered to show just entries for the selected employee. 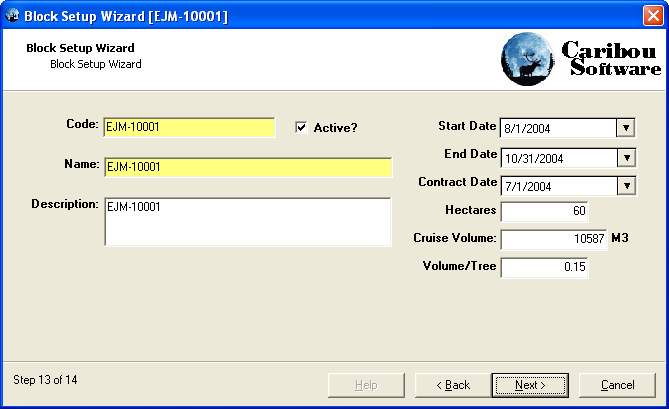 To do the actual time sheet data entry, you'd use a window like the one shown below. Note that the time sheets are highly configurable, and this is just one example format. You may collect different data items than those shown below. When we first get you started with the software, we work with you to ensure the time sheet window is tailored to meet your needs. 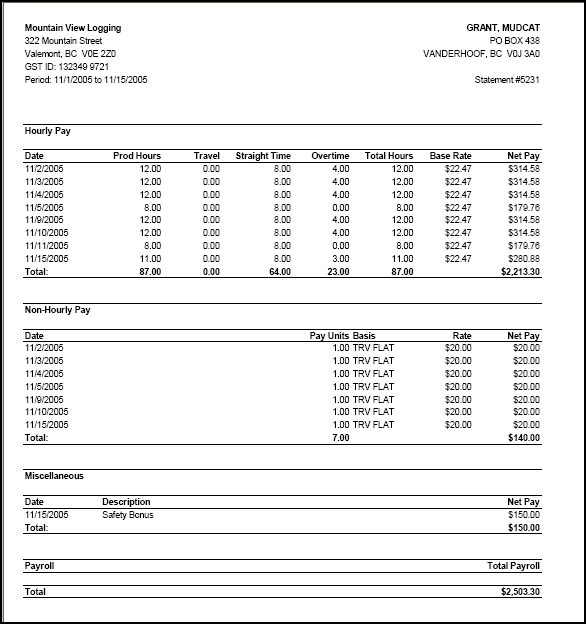 You can print nicely formatted pay statements for gross payroll purposes showing the employee his hours worked and gross payroll. You can also add on additional miscellaneous additions or deductions to his statements, and can include calculations for daily charges such as pick-up allowances or travel allowances. This report is very valuable for showing you how many cubic meters per hour you harvested for each phase, and your cost per cubic meter for each phase, based upon a "full-found" hourly equipment rate. This report provides an actual profit and loss report for each block. It shows revenue earned on the block, as well as all costs recorded in The Logger's Edge for that block. 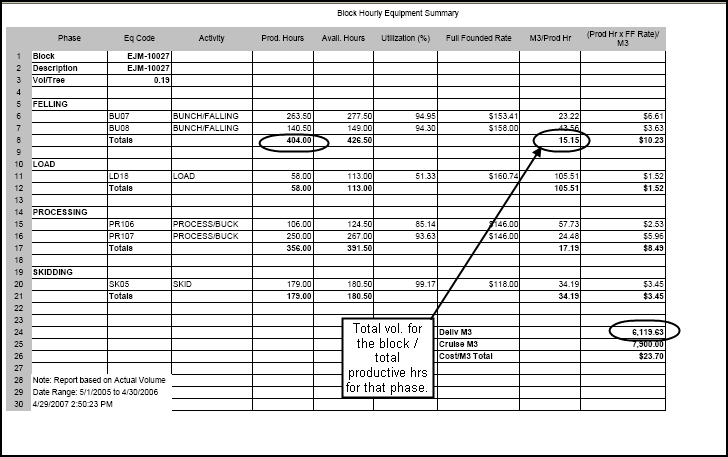 Costs include actual labor costs (including an employee load factor to account for benefits), equipment costs (based on standard "dry" hourly equipment costs (equipment costs net of any labor assumptions), any day rates paid in connection with the block (e.g., hand fallers paid by the day, daily travel allowances, etc), contract trucker, processor, etc. costs, driver pay for your own trucks plus standard costs for your own trucks, and any other miscellaneous expenses you've assigned to the block. This report shows average cycle times for all the trucks traveling from block "BL10212" to the "GC" mill. 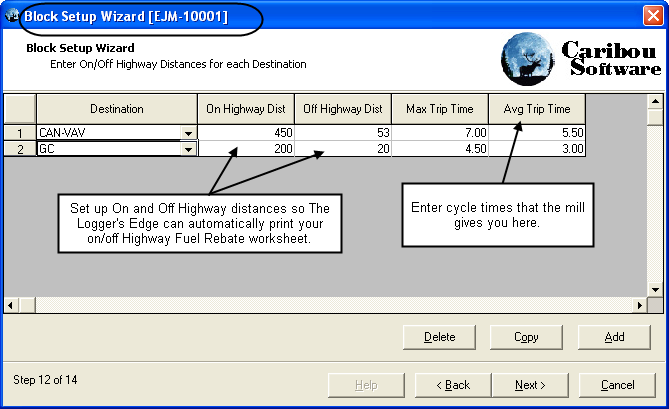 For example: truck J432 made 6 trips for that block-destination combination where a cycle time could be calculated. The average cycle time was 3.72 hours, and the average time spent in the yard was just under 1/4 of an hour (.24 hrs). 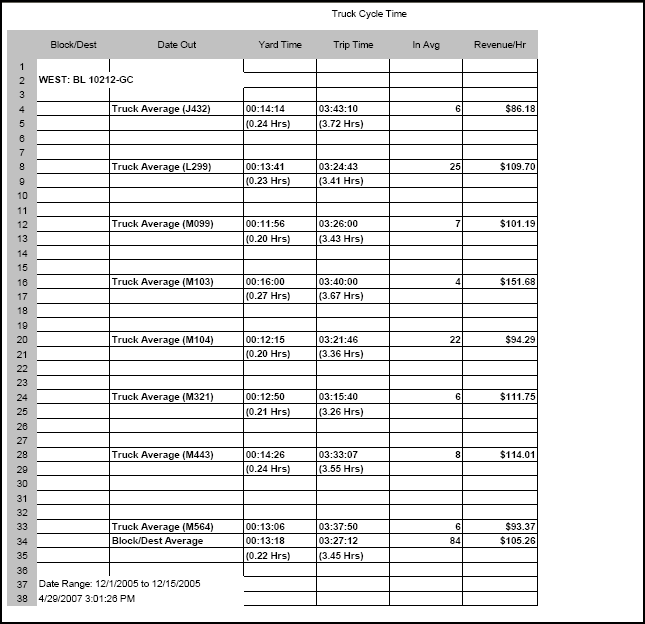 The revenue per hour of $86.18 per is calculated by taking the total revenue associated with that truck for those trips, and dividing that value by the cycle time of 3.72 hours. This report is excellent for monitoring the performance of your own trucks and drivers, and for comparing the performance of your own trucks to that of contract truckers. 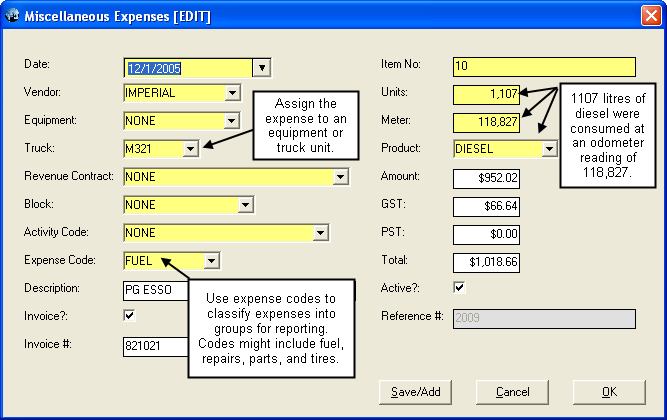 Alternatively, you can run an Expense report for each unit, by category of expense. 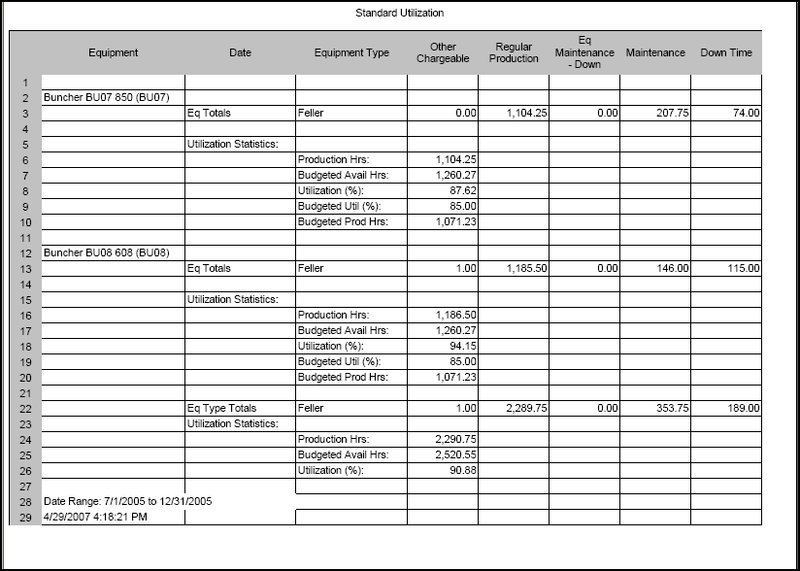 The report below shows all fuel purchases for a particular truck within a given date range.